2017 marks the 500th anniversary of Martin Luther's posting of the 95 Theses to the church door at Wittenberg, with which the Reformation in Germany and Protestant church music began. 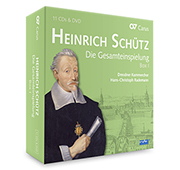 Heinrich Schütz was the first Protestant church musician of European stature. 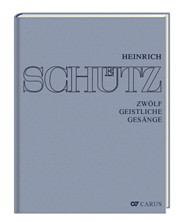 In 1992 the Stuttgart Schütz Edition, the edition of the complete works of Heinrich Schütz, was taken over by Carus-Verlag, which has continued to publish it since then. It is a complete edition founded on a critical examination of the sources which presents today's users an unproblematic, legible rendering of the music. 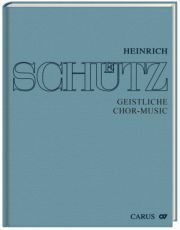 In contrast to other Schütz editions the works are presented in their original keys and ranges, i.e., they are edited untransposed. All editorial additions or suggestions are indicated diacritically. The volumes include all essential information concerning the history of the works, their transmission, performance practice and liturgical function. 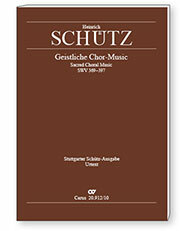 Original clefs, as well as the ranges of the vocal parts and the upper instrumental parts are prefixed to the first brace of the score. The Stuttgart Schütz Edition is being published in cooperation with the renowned Heinrich-Schütz-Archiv of the Hochshule für Musik Dresden. 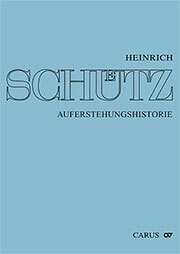 Editors who are experienced musicologists and knowlegeable in performance practice have been engaged for the Edition. A complete subscription will receive a 20 % discount off the retail price. Normal 0 21 Opus 3 for six to eight voices with figured bass.